Thread: Old Spectacle Frame? SOLVED! I found this artifact two weeks ago at a site that yielded us 28 coppers. Could it be from an old spectacle frame? The Indian Head cent is there for size reference. Looks like a part of old scissors to me. 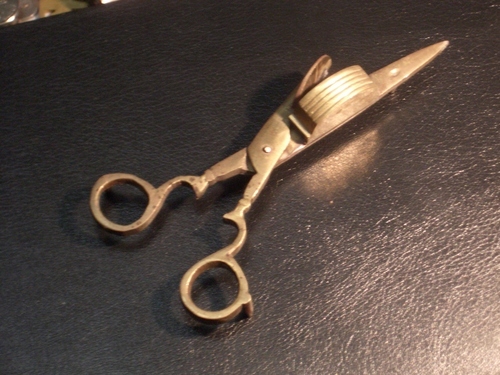 Handle from a candlestick, handle from a candle snuffer, or handle from a pair of scissors. My wags in order of probability. "Gold rides an iron horse." What do you think the pin hole is there for? Yup, that definitely looks like that would be it. Thanks for the assistance, Johnny and everyone else.